“For advanced aspirants on the path, initiation will occur at various stages. Sometimes your entire life will feel like an initiation, at other times specific areas will be flowing easily whilst others are deeply challenging. This Oracle comes as confirmation that you are not needlessly suffering. If you can find the light within the struggles, tests or challenges that face you now, you will experience breakthrough healing. 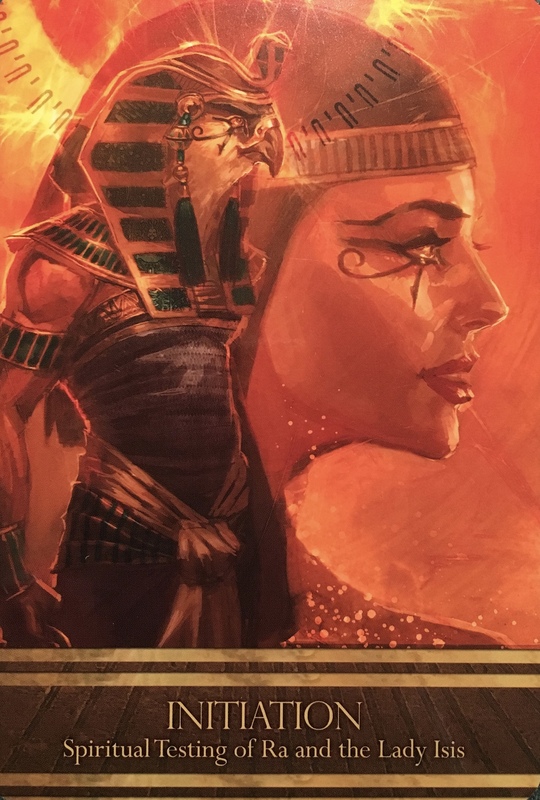 It is the almost unbearable solar fire of Ra that can cleanse the Soul of wounds and the love, compassion and intelligence of Isis that can temper the heat of Ra and stop it from burning and drying you out, or else you would be left with nothing but emptiness, anger, bitterness and despair in your heart! These are not meant to be the outcomes of life’s challenges! Rather than losing love and hope through the challenges of life, the Initiate understands all aspects of life are growth opportunities in various states of disguise, waiting to be discovered. As an Initiate, this Oracle urges you to honour life as a gift and treat any challenge or pressure as a way for you to grow into a brighter and purer light capable of great spiritual service on this planet. That spiritual service includes growing an ability to be able to love freely and beyond limits, to love with courage and faith. Sometimes along the path of awakening, expansion and enlightenment, we come to a crossroads, a challenge, or a test. It can feel like we have hit a wall; that we just can’t go any farther. It feels as if we have been stripped down, naked and vulnerable and raw. Maybe it even feels like everyone is against us; or it feels like we are completely isolated and alone. And so we stand at the crossroads, weighing our options. Do we turn back to what we know? No, it’s too late for that now, we have long passed the point of no return. Do we hunker down and try to weather the storm? Yes, that is a possibility, yet our heart and Soul feels restless; there has been too much stagnation of late. Our only choice is to persevere. It’s scary and we can’t see the end, we can’t see our destination and we don’t even know at this point if it is there in front of us, or if it is all an illusion. So we dig down deep. Faith is the only option. We move forward with absolute conviction that we are going in the right directions. It may take a little longer than expected. There may be a few more bumps in the road. Things may not look how we expected them to look. But we keep going. We have faith. Faith in ourselves, faith in the Universe. Faith in the whisperings of our heart. And we move forward fearlessly.